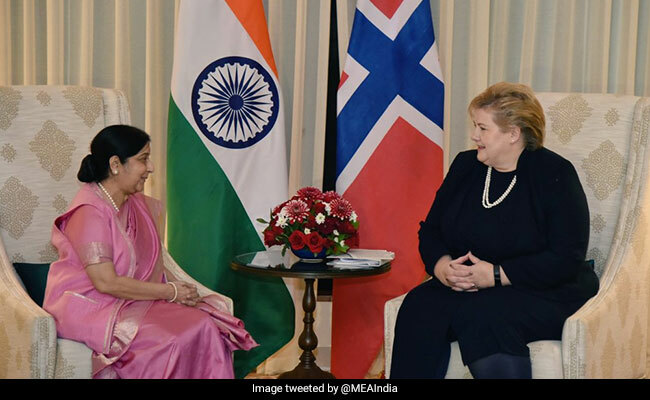 External Affairs Minister Sushma Swaraj and Norwegian Prime Minister Erna Solberg discussed ways of expanding bilateral ties. Norwegian Prime Minister Erna Solberg arrived in New Delhi on Monday for a three-day visit. External Affairs Minister Sushma Swaraj met visiting Norwegian Prime Minister Erna Solberg in New Delhi on Tuesday. The two leaders discussed ways of expanding bilateral ties. "Good exchange of views on expanding ties across all sectors," External Affairs Ministry spokesperson Raveesh Kumar tweeted. "Immense opportunity to cooperate in blue economy, shipping, fisheries and aquaculture and renewable energy," Mr Kumar said. Earlier, PM Solberg was accorded a ceremonial welcome at the Rashtrapati Bhavan. PM Solberg also met PM Modi today. She arrived in New Delhi on Monday for a three-day visit.